Handguns don't affect movement speed, and can be fired as fast as you can pull the trigger. 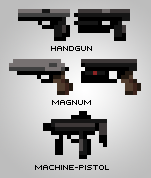 A few different types of sub-machine guns, that will vary in clip capacity and fire rate mostly. 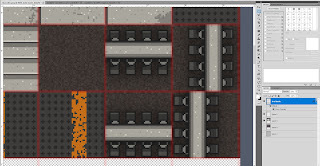 In Downfall, Inc., sub-machine guns are a good middle ground between pistols and rifles, offering decent movement speed and fire-power. Four potential rifles, the first three being automatic and the last being a semi-automatic. They'll vary in damage and spread. The first will most likely be used by the mercenaries brought in at higher threat levels. Finally, here are some shotguns. The first two are pump action, with the third being an automatic shotgun. It's going to be a late-game, high cost weapon to unlock. So yeah, guns. Actual progress to follow, haha.